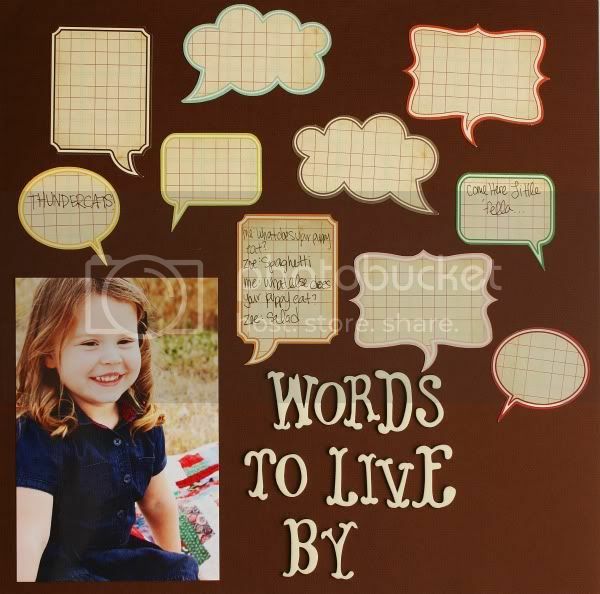 In my October Polka Dot Whimsy Kit, we got these great quote bubbles by Shabby Chic Chafts. I knew as soon as I opened them up, what I wanted to use them for. Zoe is constantly making us laugh with her funny phrases and interesting conversations. I needed a place to compile them. I've made layouts before with her funny sayings and I love keeping that tradition up. As you can see, this layout is unfinished, but I know it won't take long to fill in the rest of the bubbles. My favorite one up there, is a conversation we had a few months ago. Me: What does your puppy eat? Me: What else does your puppy eat? super cute! love the bubble quotes! soooo cute! what a beautiful little girl you have. That is such a cute way to remember those sweet things that she says!